William Hague entered Parliament when he won Richmond, North Yorkshire at a by-election in 1989. He was re-elected a further five times to Parliament. Within two years he had become PPS to the Chancellor of the Exchequer and by 1994 he was Minister of State with responsibility for Social Security and Disabled People. His first cabinet role was as Secretary of State for Wales in 1995. He was widely credited for leading a successful campaign against the country joining the Euro. In 2010 he was appointed Foreign Secretary, and dealt with one of the most tumultuous periods in modern history with unrest across the Middle East, and crises in Europe. After four years as Foreign Secretary, he declared his intentions to step down from front-line politics at the 2015 General Election. 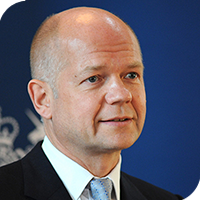 Lord Hague has written critically acclaimed political biographies of William Pitt the Younger and William Wilberforce. He has various non-executive roles and is Chairman of RUSI.